Boys offering Christmas money as reward for stolen dog. 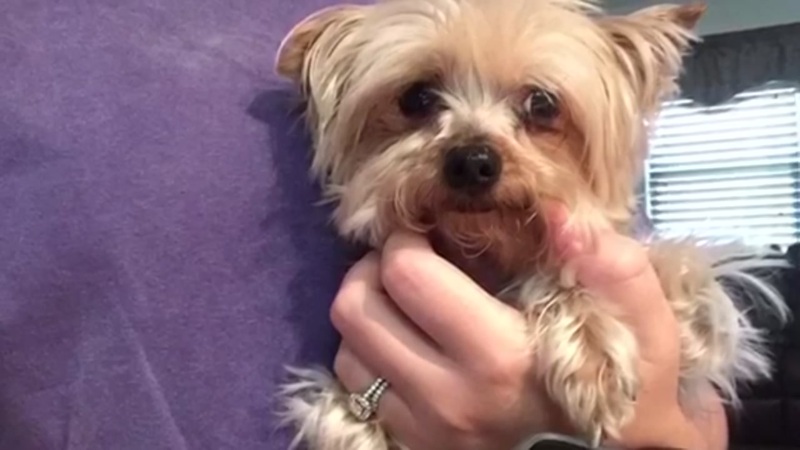 HOUSTON (KTRK) -- A family in northeast Houston is searching for their small Yorkshire Terrier mix after someone stole it off their porch early Monday morning. Jorge, Jacob and Santiago Hernandez are three brothers who own the dog. They saved money and bought Toby, the nine-month-old Yorkie Maltese mix, earlier this year. Their surveillance camera caught a man taking the pet carrier that Toby was inside at the time off the front porch. A family's dog wandered away Wednesday and was picked up by a veterinary clinic worker, but what sounds like an ideal situation ended up with the dog being lost. "I never expected something to happen like that," said Jacob, 13. The surveillance video shows a man covering his head with his face visible. He can be seen taking the pet carrier before leaving in a vehicle. "[I] thought maybe they'd take a bike," said Santiago, 8. "Not Toby." The boys are especially heartbroken because they saved money this summer to buy Toby. "That dog -- not only was he like a member of the family, it was pretty pricey to get him," said Jorge, 17. "How could somebody be that heartless?" The boys' parents filed a report with HPD, but officers said the case could be difficult to solve without more information, the family said. The brothers are not giving up. They're setting aside earnings and Christmas money to offer a $100 reward for Toby. "He's like a brother named Toby," Jorge said.